In an era where the NFL has evolved into a highly sophisticated passing league where RBs don’t matter, Greg Roman’s smash-mouth offensive philosophies are in direct contrast to this. With his outlier offensive tendencies being an anomaly in today’s game, I wanted to dig into his career and see what we could project for the 2019 Ravens offense that seems to be built perfectly for what Roman likes to do – pound the rock. Let’s have a look at who and what Roman is as a play-caller and offensive mind. The broad overview of Roman’s coaching career has him working his way from an OL assistant with the Panthers under Dom Capers and George Seifert as his Head Coaches, a TE & QB coach for HOU with Capers again, an OL assistant with Baltimore under Brian Billick, an Offensive Coordinator for his High School alma mater for a year, a TE/OT coach for current Ravens coach John Harbaugh’s brother Jim at Stanford and then Jim’s OC with the 49ers, a year and 2 games as Rex Ryan’s Offensive Coordinator in Buffalo, then back to Baltimore to coach TEs and to be John Harbaugh’s Senior Offensive Assistant/Assistant Head Coach as well as the unofficial “run game coordinator”. 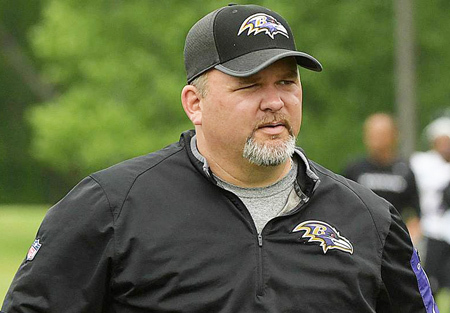 He’s worked in what has been a close-knit circle where some of the Defensive Coordinators he’s been on the same team with have been there with him on more than one team. These prior employers tended to all have a conservative offensive approach with a strong defensive mind coaching on that side of the ball. The development of Roman as a play-caller really began when he spent a year calling plays for his former High School. There was a notable story about him not having enough TEs for a particular game, so he had to use his offensive tackles at that spot. Thus, what Roman calls his “Giant Personnel” was born. Roman likes to use extra offensive linemen up front and challenge the defense to adjust. He’ll show the same blocking concepts from his personnel groupings but will have multiple run concepts come out of those packages, including the QB read option. Roman’s offense wants to out-number the defense up front and get the blockers into angles that allow huge holes to open up for whoever carries the ball. He’ll use counters and traps to gain an advantage for his blocking schemes and will heavily involve TEs and FBs into the offense. As noted above, Roman wants to maximize the beef up front and challenge defenses to match up and try to outsmart the defense with the play call. Including the 2 games, he called plays for Buffalo in 2016, Roman’s running games have averaged 4.7 yards per carry and have shown an overall increasing trend, especially after the first year he gets to a team. Roman’s teams have ranked in the top 10 in Rush Attempts and Rush Yards every year as an OC, and are usually in the top 5. These numbers are also reflected in Baltimore once he took on the unofficial role of “Run Game Coordinator”. Although his first year in Baltimore was ranked 11th in Rush Yards, last year the Ravens were #1 in Rush Attempts and #2 in Rush Yards. Roman’s RB1 has seen a carry share of 52-57% while the RB2 has seen a share of 15-23%. His RB1 sees a target share of 4-14%, with 14% being the outlier. Frank Gore only averaged a 6.4% target share over 4 years with Roman. In general, the RB position saw 4.5 targets per game with Roman as an OC. While his tenure in Baltimore the last two years shows an increase in targets to RBs up to 7.6 per game, this can be expected to decline. As the starting QB last year (7 games sampled), Lamar Jackson only targeted his RBs 2.3 times per game for a 15% target share. Free agent signee Mark Ingram has a career average of 2.7 targets per game but had a three-year run prior to Alvin Kamara’s arrival in New Orleans of 4.3 targets per game at a 12.8% offensive target share. Ingram is more than capable of catching passes and keeping the defense guessing. Last year’s leading back down the stretch, Gus Edwards, telegraphed run when he was in the game, as he was not used as a passing option in the offense. Buck Allen, Alex Collins, and Ty Montgomery were the primary receivers out of the backfield for the Ravens last year, and all three are now off the roster. Overall, Baltimore has 83 vacated targets to the RB, which is 90% of the target share that went to the RB position now up for grabs. Ingram was brought in to fill this role, but the Ravens could draft another back with some pass-catching chops that could push Kenneth Dixon and his 7 targets off the roster, too. The catalyst of Roman’s offenses tend to be his QBs. Roman has a history of working with mobile QBs, with rosters that included Alex Smith and Colin Kaepernick in SF and Tyrod Taylor in BUF. From 2012 – 2015 Kaepernick and Tyrod averaged 6.5 rush attempts per game at an 18-23% carry share. He turned the dial all the way up on that last year for Lamar Jackson who ran the ball an average of 17 times per game as a starting QB. I don’t imagine Jackson will run with that sort of frequency in 2019, but he could certainly stay well above the 6.5 per game mark set by his preceding QB peers. Along with all those carries, Jackson’s average rushing yards per game was 79 yards per game, where Kaep and Tyrod were around the 30-40 yards per game mark. This is another area I would expect some decline in Jackson’s game as Roman may not want him taking so many hits as they try to develop him more as a passer in 2019. Having mobile QBs buys his offense time for routes to develop downfield, and his QBs will look for the deep ball whenever possible. The WR1 is the most heavily involved in the offense, as they are in most offenses. However, Roman’s had teams with a good second WR that also saw a fair amount of action. Roman also tends to keep a TE busy in his offense, but he’s had a couple of really good ones that created a spike in usage with Vernon Davis and Charles Clay. Roman’s #1 WRs in SF were Crabtree then Boldin. 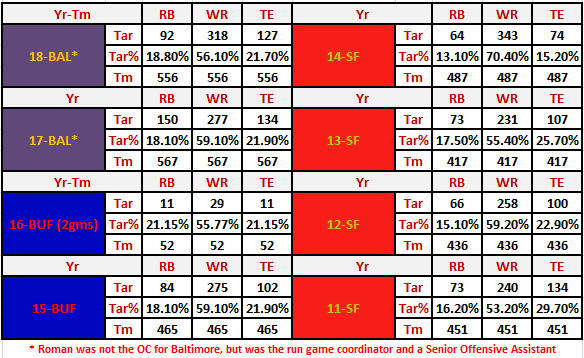 In their WR1 roles, their target share ranged from 27-31% over 4 years with a total target volume of 115-130. Only once in those 4 years did both Crabtree and Boldin each eclipse 100 targets each. In his only full year with Buffalo, Sammy Watkins and Robert Woods had 96 and 80 targets respectively, with neither playing a full season. Vernon Davis and Charles Clay combined to average 5 targets per game from 2011-2015, with Davis notching a 95 target season in 2011. Overall, the positional target distribution for a Roman offense looks something like 13-18% to the RBs, 53-59% to the WRs (an outlier in 2014 saw 70% target share for WRs), and 21-25% to the TEs. Lamar Jackson’s target distribution last year was 15-55-27 percent to RB-WR-TE. With the current lack of reliable pass catchers on this Ravens roster, I would expect the TE usage to increase in 2019. Baltimore drafted a TE in Rounds 1 and 3 of the draft last year, which could be a signal they are looking to utilize that position quite a bit going forward. Roman’s offensive passing ranks fall to the bottom of the league where his teams have ranked between 29th to 32nd in Pass Attempts and 23rd to 30th in Pass Yards. The 2 years in Baltimore with Mornhinweg running the passing offense has the Ravens at 11th & 16th in Pass Attempts and 29th and 22nd in Passing Yards. His QBs do end up with a solid average yards per attempt each season, averaging 7.7 YPA over the 5 full years Roman has been an OC. 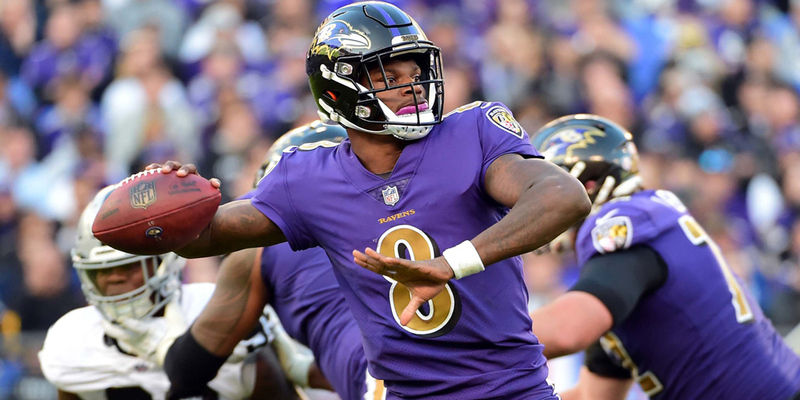 Lamar Jackson’s YPA was 7.1 last season, and he was at or above 7.1 in 4 out of his 7 starts. Romans Pass: Run ratio has an average of 52% Pass to 48% Run in 5 years as an OC. Last year, with Lamar Jackson as the starting QB, that ratio skewed to a 35% Pass to 65% Run ratio. That 35% pass ratio should increase heading into next year, and I currently project a 48% Pass Ratio, ergo a 52% Run Ratio. Some of this has been covered as we’ve gone through the components of a Roman offense, but some notable trends are how he uses the talent on his roster to dictate his approach to each season – and game. Gore was not a terrible pass-catching back, but he was not heavily involved in that aspect of the offense with the Niners. The fullback Bruce Miller was deployed some in a pass-catching role with a 5-10% target share to cut into Gore and Kendall Hunter’s work. Once he got to Buffalo, he utilized Shady McCoy more than any other single back as a pass catcher, which was still somewhat minimal and only equated to 50 targets during a 12 game season for Shady in 2015. The best WR duo he’s had to work with was in SF when Anquan Boldin was winding down his career and Michael Crabtree was still in his prime. In 2014, both guys totaled over 100 targets each. Before Boldin got to SF, it was Vernon Davis at TE getting looks with 95 and 61 target seasons. Charles Clay saw 77 targets in 2015 while Sammy Watkins, Robert Woods, and especially Percy Harvin missed some games that year. Bottom line is he’s going to pound the rock and make do with what he has for pass catchers to the best of their abilities. Though Roman was in the building last year helping out in the run game, we should still take note of what their rookie signal caller did as a passer. Lamar Jackson’s Next-Gen Stats were middle to upper-middle for the field. Jackson was 8th in Average Completed Air Yards, tied for 13th in Average Intended Air Yards, and was 11th in Aggressiveness. His Expected Completion Percentage was toward the bottom of the league though, which is something that could be a factor heading into next year if he doesn’t improve in that regard. Rookies tend to struggle a bit in their first year, so we should be able to expect some improvement across the board on his data. The most interesting part of the offense for me will be to see the number of plays run per game, as this is what drives a lot of fantasy opportunity and more importantly, fantasy points. Baltimore has been among the league leaders in plays per game for the past 4 years. With Roman’s commitment to running the ball, the clock should tick down faster and their total number of plays per game should settle back toward the league average. However, that was not the case during Jackson’s 7 starts, where the Ravens averaged 68 plays per game. But, that was under a different OC who was let go so Roman could run the show. During Greg Roman’s 5 full years as an OC, his average Pace is 29.5 seconds per play which on average for those 5 years ranks his offenses 29.6 in the league. Four of those five years (all with SF) his offenses ranks 30 or 31 in pace of play. My current projection has the Ravens running around 960 total plays in 2019, which is a 60 play per game average. If Roman stays true to his historical Pass: Run ratios, then we can expect the split of those 960 plays to be something along the lines of 460 passes and 500 runs. On a per player basis, the 500 run plays could look like 130-140 runs for Lamar Jackson, 220-230 runs for Mark Ingram, 80-90 runs for Gus Edwards, and about 40 carries going to various other players. If history holds true, then 50-60 targets should be going to the RBs as a whole. The other 400-410 passes could be distributed with around 250 to the WRs and ~150 to the TEs. If Willie Snead earns a 25% share of the 460 passes, then he should see at least 115 passes come his way. That’s not going to be elite for fantasy football purposes but would make him a WR to target late in deeper leagues. The TEs could cancel each other out a bit, but I would prefer Mark Andrews over Hayden Hurst based on last season’s showing. Hurst has the higher draft pedigree though, so he could see a bump in targets if he catches on better this year. I’m beginning to think we’re going to see a totally unique offense emerge in Baltimore this year based on their current roster. 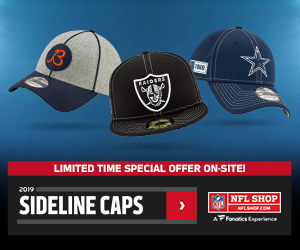 They’re obviously going to have to restock at WR before the season starts, but they’re down to making choices between already passed over free agents and rookies to fill those spots. The draft has some solid options at both WR and RB positions that could fill their needs for depth and a possible starting WR, but I think we’re going to see a highly concentrated offense that will revolve around Snead in the slot, the second year TEs, a power running game that includes Ingram and Jackson getting the majority of the carries, and a deep threat to be added at some point so Jackson has someone to throw to when the defense starts creeping to close to the line. As far as fantasy football goes, I’ll only be targeting Mark Ingram and Lamar Jackson with any sort of regularity. I won’t mind either of the second year TEs (Hurst/Andrews) when they make sense at my picks. I don’t love Snead, but can see myself ending up with a little bit of him in my Bestball portfolios. Of course, this could change some after the draft if they end up with a guy like Hakeem Butler or D.K. Metcalf in the draft. Then, I may target the rookie WR a bit, too.